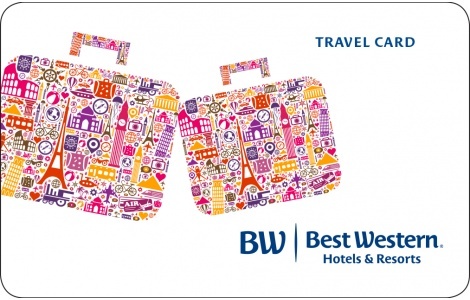 Best Western Travel Card® allows you to fit over 100 countries into your wallet. Travel Cards are accepted at all Best Western Hotels & Resorts 4,500 hotels worldwide and they never expire. Explore the world with one convenient card. National Gift Card is the best place for you to order Best Western Travel Card® gift cards in bulk. We are the experts in all things gift cards and can set up your gift card solutions program for you today. Please contact us for more information on bulk, direct-to-recipient, or individual gift card fulfillment for your gift card program. Contact us here or call us at 888-472-8747 today! Applicable toward Best Western® hotel charges. Not exchangeable for cash and no change will be given. Fully transferable. Card not replaceable if lost, stolen or destroyed. Visit travelcard.bestwestern.com for complete terms & conditions. Terms are void where prohibited by law. Issued in Arizona, U.S.A. Best Western International, Inc. Best Western and the Best Western marks are service marks or registered service marks of Best Western International, Inc. All rights Reserved.